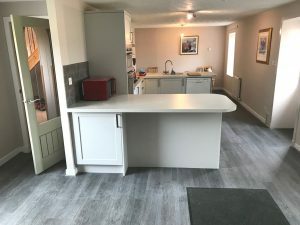 Easter Cullachie Steading is, as the name suggests, a converted steading which has been renovated and extended to provide a substantial property of good proportions. 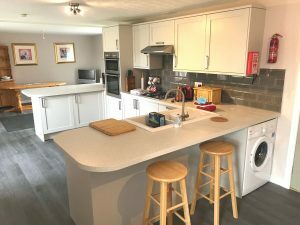 At present it is used as a successful holiday lettings business (sleeping up to 8 people) and could be purchased as such, complete with the furniture and future bookings. Further details are available on request. 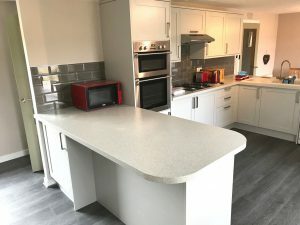 It also benefits from oil fired central heating, double glazing, upstairs lounge with wood burning stove, 2 en-suite bedrooms and large open plan kitchen/dining/sitting room (9.58m x 4.40m) which has just had a makeover, including new kitchen units, wood effect laminate flooring and painting throughout. To the rear of the property are two block-built stores, the larger one of which is divided into 3 sections and could be utilised for a number of uses e.g. bunk house, workshop, studio, stable etc. A private driveway leads from the B970 to tarred parking area for several cars at the front of the Steading. The front garden has two raised decking areas, patio area and mature shrubs. The rear garden is bounded with wooden fencing and laid to gravel with raised decking area. Access to the integral boiler house is at the rear, as is the oil tank. There are also two concrete block stores, the larger of which (7.4m x 4.3m) has been divided into three sections and could be utilised for a variety of uses. Carpets, blinds and curtains. Fitted floor coverings. Light fittings. Other items are available by separate negotiation. Mains electricity and water. Private drainage. Telephone. A Home Report is available from our website: www.caledoniaestateagency.co.uk. The property is currently business rated. Please note there are business rate grants for small businesses. Glazed front door. Stairs to first floor with storage area below. Hatch to electric meter and fuse board. Window to side. Central heating radiator. Door to W.C. Archway through to hallway. Corner W.C. and white wash hand basin. Opaque window to side. Pine lined walls to dado height. Central heating radiator. Vinyl flooring. Long hallway with glazed doors to kitchen and dining areas and door to Bedroom 1. Built in shelved storage cupboard. Central heating radiator. Double aspect room with views over open countryside to surrounding hills. Open plan to kitchen and family room. Central heating radiator. 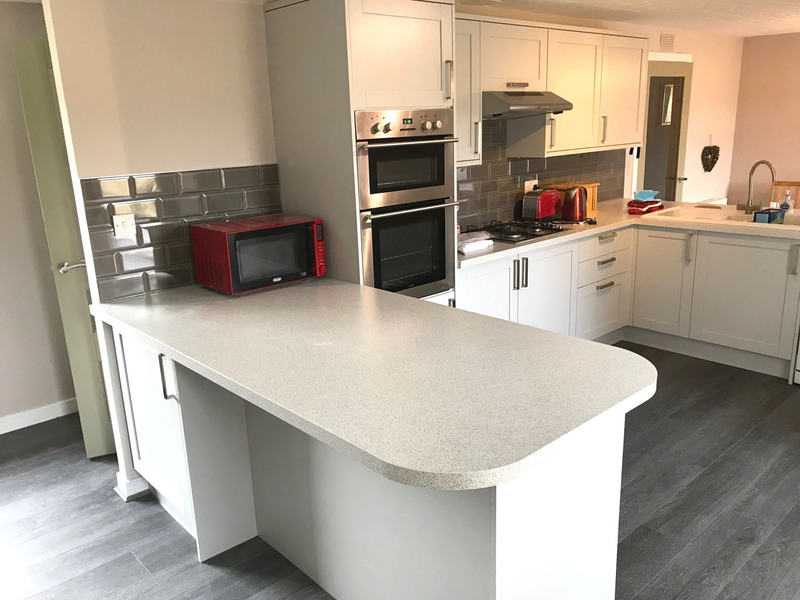 Newly fitted base and wall units incorporating 11/2 bowl white sink with mixer tap, electric double oven & grill, extractor hood and two breakfast bars. Wall tiling above worksurfaces. Triple spotlight cluster. Glazed door to rear garden. Window to the rear overlooking farmland to the hills beyond. Two central heating radiators. Telephone point. Glazed door to hallway. Spacious double room with window to the side. Built-in double wardrobe with hanging and storage space. Telephone point. Central heating radiator. Door to en-suite. Three piece white suite, compromising pedestal wash hand basin, WC and shower cubicle with mixer shower. Wall mirror, strip light and shaver point. Recessed spotlights. Central heating radiator. Doors off to Bedrooms 2, 3 & 4 and bathroom. Shelved linen cupboard. Central heating radiator. Smoke alarm. Glazed door to lounge. Bright and spacious, double aspect room with feature stone fireplace, incorporating display recesses, timber mantelpiece and housing the wood burning stove. Two built-in storage cupboards and book shelving below front window. Brass effect wall lights on dimmer switch. 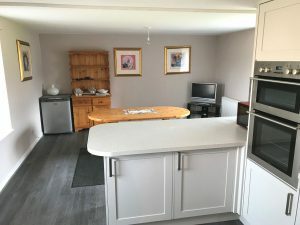 Double room with fantastic views to the rear over the surrounding countryside. Fitted units along one wall incorporating hanging and storage space. Two spotlights above bed. Double room, again with fantastic views to the rear. Fitted units along one wall incorporating wardrobe and glass display shelving. Central heating radiator. Hatch to loft. Spacious double room with window to the side overlooking farmland and hills. Two spotlights above bed. Central heating radiator. Door to en-suite. 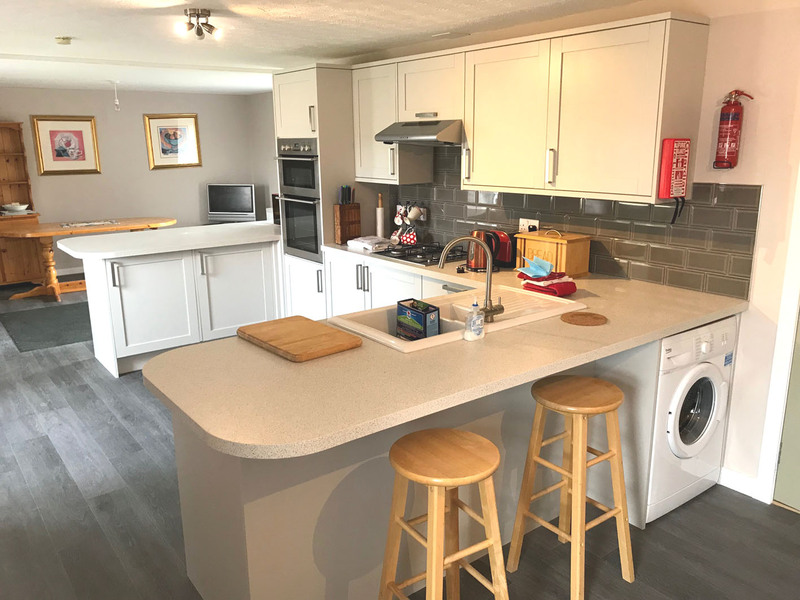 Three piece white suite, comprising pedestal wash hand basin, WC and large shower recess with sliding door, instant shower, extractor fan light and waterproof panelling. Wall mirror. Heated towel rail. Glass wall shelf. Large bathroom with opaque window to the front. Three piece coloured suite comprising pedestal wash hand basin, WC and bath with instant shower and glass screen over. Storage cabinet. Wall mirror. Glass storage shelf. Strip light and shaver point. Central heating radiator.